Cor-Pak VpCI Reinforced Paper is the premium corrosion inhibiting reinforced paper in the industry. The patented Vapor phase Corrosion Inhibiting technology has revolutionized the way metals are protected in an enclosed package. Cor-Pak VpCI Reinforced Paper provides superior corrosion protection for both ferrous and non-ferrous metals, eliminates the need to stock a variety of papers for all the different types of metals and alloys you need to protect. Additionally, Cor-Pak VpCI Reinforced Paper is non-toxic and doesn’t contain any nitrites, phosphates, silicates or other hazardous compounds. Cor-Pak VpCI Reinforced Paper is made from the highest quality neutral natural kraft paper and has excellent tear resistance. It also offers a barrier to water, oil, and grease. There are no chemical concentrations to calculate, no chemical tanks or application system to maintain. Just wrap your products in the paper, and fold edges together. Use adhesive tape as needed to hold paper folds in place. The VpCI coating on the paper vaporizes, reaching all metal surfaces to provide complete corrosion protection. The unique inhibiting action of the VpCI forms a very thin and very effective protective layer that does not alter the appearance of products or require removal. Parts protected with Cor-Pak VpCI Reinforced Paper can be painted, welded, and soldered. The protective layer does not influence physical properties of most sensitive electrical components, including conductivity and resistance. 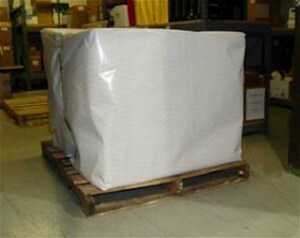 TYPICAL APPLICATIONS: Cor-Pak VpCI Reinforced Paper can be used to protect products for storage and shipment in a wide variety of ways: wrap for single item packaging or interleaving, end closures for shipping tubes, insert strips for recessed areas in large packages; and as sheet liners or separators between products. Cor-Pak VpCI Reinforced Paper is used in packaging of metals with pointed, odd shapes, or sharp edges where puncture would be an issue with non-reinforced papers. It’s also used in applications where damage to the item caused during shipping is a concern when using non-reinforced papers. Metals industry: coils, wire reels, plate, bar, etc. Metal forging and die casting: raw and machined forgings and castings. Finished products: engines, machinery, tools, hardware, appliances, instruments, motors, etc. Extremely durable paper allows you to ignore normal handling issues found in non-reinforced packaging papers. One product for all ferrous and non-ferrous metals. Non-toxic. Contains no nitrites, phosphates, silicones, chromates, or other heavy metals. Effective against aggressive environments including humidity, SO2, H2S, and galvanic corrosion from dissimilar metals. Protective layer does not need to be removed prior to further surface finishing or coating application. Protects dry or oiled metals during storage, transit, and overseas shipment. Natural grade paper eliminates package contamination. Combines corrosion protection and packaging into one step. 48" x 600' - Cortec Product Code: 40608593 - Shipping Weight: 62 lbs. 60" x 600' - Cortec Product Code: 40608594 - Shipping Weight: 76 lbs.